The State of Nature in Oxfordshire 2017 report draws together a wealth of expertise from the county’s professional and volunteer base in biodiversity and nature conservation. 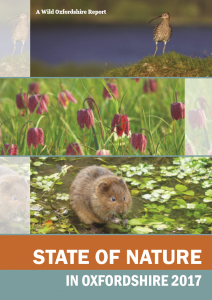 The best information currently available has been used to paint a picture of the state of Oxfordshire’s natural habitats and species, including long-term trends as well as more recent losses and gains. Of necessity, there is a focus on those species groups (e.g. birds and butterflies) for which there are substantive amounts of data that have been collected in a consistent manner over an extended period. Other species groups would benefit from additional resources to improve the extent and consistency of species recording effort. The report has been produced in two versions, a highlights report and the full report. Click on the images below to download, or contact Clare@wildoxfordshire.org.uk to receive a free printed copy (highlights report only). Both reports look at five broad habitat categories that encompass the full diversity of habitats found across the county. For each habitat headline findings are presented including the current and historic extent and condition of specific habitat types, and recent changes and trends for characteristic species (where these are known). Relevant case studies are also presented, reflecting the breadth of work that is underway across the county. The highlights report restricts case studies to one per habitat type, whereas multiple studies are contained within the full report. Case studies can also be viewed and downloaded from the case studies page.